Calabar sounded the alarm when its quartet of Rosean Young, Christopher Taylor, Tyreke Wilson, and De’Jour Russell clocked 39.51secs to win the Championship of America 4x100m. That time became the second fastest ever at the Penn Relays for this event. At the 2017 renewal of the Relays, five Jamaican teams ran under 41 seconds in the event, with Calabar setting a record of 39.00secs. In a repeat performance this year, five Jamaican schools led by Calabar again went below 41 seconds in the final, as runners-up were Calabar archrival Kingston College, 40.13 and Jamaica College, 40.47; second and third, respectively. Other Jamaican teams in the final were Papine, 40.86 and St Jago, 40.88, fifth and sixth, respectively. St Elizabeth Technical did not finish. 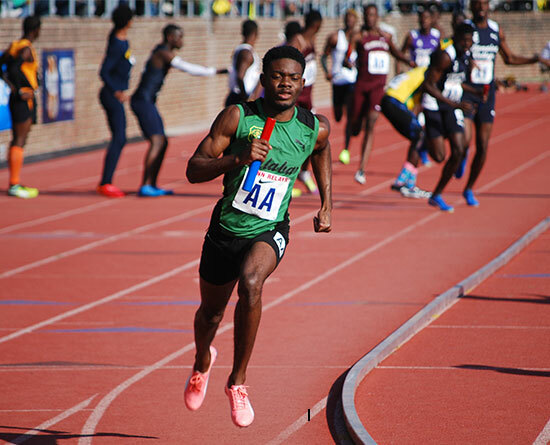 Calabar then went into full record-breaking mode; the team of Devannah Gayle (1:53.63), Rivaldo Marshall (1:51.17), Kimar Farquharson (1:50.61), and Jovan Taye Williams (1:50.70) broke the 2009 Championship of America 4x800m record of 7:30.67 by Ablemerie of Virginia, (US) with a new mark of 7:26.09 ahead of their countrymen from St Elizabeth Technical High School (STETHS), finishing second—also inside the old record—in 7:27.54. Jamaica College (JC) ended third in 7:32.32. Cavvelle Beckles (1:54.72), Dugion Blackman (1:50.54), Fabian Campbell (1:52.92), Ken Reyes (1:54.16) made up the JC team. Things got even more exciting as Calabar lined up for the final high school event—the Championship of America 4x400m. Lead-off man Malik James-King put Calabar at a slight advantage, and Anthony Carpenter (whose health status was questionable after Champs) allowed no-one to get close to him before handing off to Shemar Chambers. The third-leg runner also increased the lead Carpenter gave him and handed over to ace quarter-miler Taylor. With the crowd on its feet, Taylor zoomed to a blistering 44.84 seconds, and Calabar stopped the clock at an 3:03.79, the fastest time ever by a schoolboy team in the event. Calabar erased their own 2017 record of 3:08.59 by Carpenter, Aykeeme Francis, James-King, and Tayor, in that order. Four Jamaican schools placed directly behind Calabar. Second to sixth, respectively were Petersfield, 3:09.60; Kingston College, 3:09.60; Jamaica College, 3:10.29; Holmwood Technical, 3:11.35; and Edwin Allen, 3:13.37. Newburgh Free of New York, 3:18.66 and Rhodes Hall of Jamaica, 3:22.44, rounded the field.